Synergy has launched a robotic fulfilment cart, SnapCart, to help small parts picking and e-commerce fulfilment centres streamline picking operations without requiring any infrastructure changes. SnapCart works alongside manual carts and operates under a cellular picking model. Warehouse pickers are assigned to smaller cells which are serviced by an autonomous cart working on a pick-to-light system. As a result, the distance workers walk per day can be reduced from as much as 15 miles to one mile. 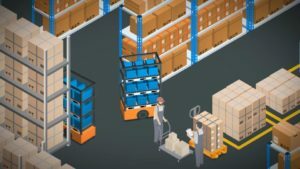 The solution is flexible and scalable as the carts can be purchased for the whole entire warehouse or carts can be added as needed. “As fulfilment operations in both the UK and US feel the strain of the current labour shortage, it’s more important than ever that warehouses ensure maximum efficiency with their workforce,” said Synergy chairman Hugh Stevens. SnapCart will enter beta testing within 60 days.